The fact that St. Augustine can be visited on a tight budget might not resonate with many Florida-bound tourists. For many, it is not on the list of top-tier Florida destinations. Places such as Orlando, Miami/Fort Lauderdale, Key West and Tampa Bay often attract more attention. But to miss St. Augustine is to deprive yourself of a delightful walk through North American history. Like Boston, Philadelphia, or Montreal, the story of St. Augustine helps explain how the rest of the New World developed and prospered. The history of this place goes back into the 1500s, but it wasn't until an ambitious tycoon named Henry Flagler arrived here that the city became widely known as a vacation destination. Flagler would build a world-famous resort and coastal railroad all the way to Miami. Jacksonville International is the largest major airport, but St. Augustine's small commercial airport hosts Frontier flights, and at times the fares are extremely reasonable. For example, budget travelers can find an occasional round-trip fare under $100 for non-stop service between here and Philadelphia on Frontier. ViaAir connects the area with Charlotte. 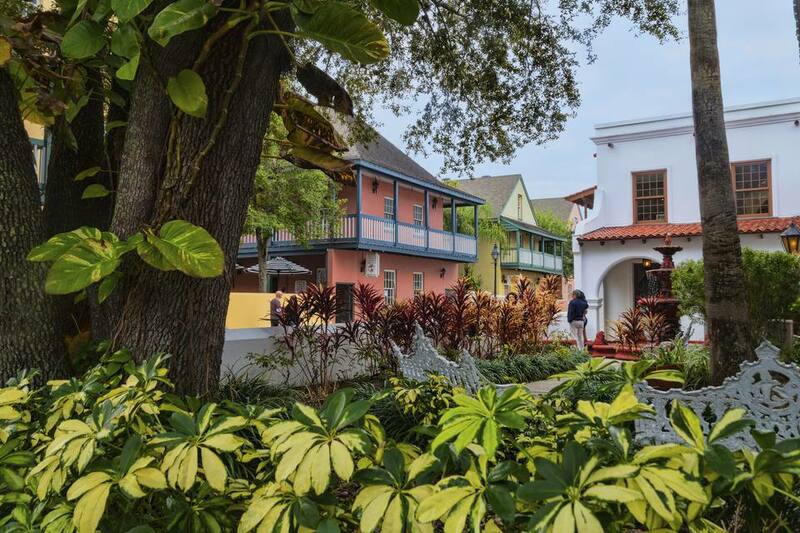 This story will introduce Flagler's preserved architectural treasures, and a strategy for making St. Augustine money-saving addition to your Florida travel budget. Henry Flagler loved St. Augustine at first sight, but he noted at least one glaring deficiency. No accommodations existed to satisfy the lofty expectations of his upper class colleagues. He developed the Ponce de Leon Hotel, which required a full winter's stay of its guests at rates that, in today's dollars, would exceed $200,000/room. The place has an incredible history. It played host to notables such as Mark Twain, Theodore Roosevelt, and Babe Ruth. It served as a training facility for the U.S. Coast Guard during World War II, and was the site of historic sit-ins during the Civil Rights era. In 1968, it became part of Flagler College. But the school still pays tribute to the historic nature of the place. Two daily tours of the former Ponce de Leon hotel are conducted, one in the morning and another in the afternoon. Adults pay $10. Spain and England both colonized St. Augustine, and some of the preserved structures are now housed in the Colonial Quarter. Allow at least an hour for the guided tour and for browsing the displays. You'll see blacksmithing and rifle demonstrations, and a close look at daily life during the period. It's a tour even younger children will enjoy, and as with so many other St. Augustine attractions, the admission costs are affordable. The Castillo de San Marcos was preceded by forts of wooden construction that did not survive. But this fort, constructed mostly of coquina limestone, never was taken in battle. The consistency of the coquina material enabled bullets and cannon balls to sink in but not fully penetrate. According to the National Park Service, the Castillo represents the only "17th century military construction in the country, and it also ranks as the oldest masonry fortress in the United States." Again, admission fees are modest: children under the age of 16 are admitted at no cost, and adults pay a National Park fee of $10, which allows return visits for up to seven days. The historic district of St. Augustine is easily seen by foot. But during the warmer months, transportation and rest take the form of trolley services that run in a loop through the city sights. The largest is Old Town Trolley, which makes 23 tops that the company links to 100 points of interest. The entire loop takes about an hour to navigate, but most people take advantage of on-and-off privileges. Stop No. 1 is at the Old Jail/Oldest Store complex on San Marco Ave. Adults pay about $26 for three days of unlimited travel, while children are charged about $10 above the age of six. It's an outlay of money at the beginning of the trip, but consider that if you stay for three days, it works out to less than $9/day per person for transportation. The pass is also good for buses that run to the beaches from stop No. 16 on St. George St. The trolley itself runs outside of the historic district to show passengers some attractions further afield. It's a great buy, since driving in the city can be difficult and parking can be expensive. The Atlantic beaches are several miles removed from the center of the city, so you'll need a car rental or a trolley pass to spend a day in the sand or book a room with an ocean view. The St. Augustine Lighthouse & Maritime Museum and the St. Augustine Alligator Farm & Zoological Park are within a half-mile of the Bridge of the Lions that connects Anastasia Island and the downtown area. The lighthouse has a colorful history and you can climb 221 steps to an observation deck for commanding views of the area. Admission to the lighthouse and museum runs $11-$13. The alligator farm also features a variety of reptile and bird species, and fossil exhibits. Admission costs are on the high side by local standards: $24 for adults, $13 for children ages 3-11. Anastasia State Park offers a variety of fine recreational activities and the quarry from which the coquina limestone was mined to build the Castillo de San Marcos. It's a great place to hike and enjoy the four miles of undeveloped beachfront within the park. Admission is $8 per vehicle or $2 for pedestrians. St. Augustine admission prices are generally moderate, but visiting a number of sites in the same day can strain a budget, especially for families. The area offers a number of free attractions that will quiet your cost concerns. You can visit working winery and distillery operations at no cost, and free samples are provided to those of drinking age. Free tours of historic churches such as Flagler Memorial Presbyterian Church, the Mission Nombre de Dios and the St. Augustine Cathedral Basilica are available. The mission church sits on the site where explorers first landed in the 16th century. A tour of Fort Matanzas is free, as is the ferry ride to get to the site. You will need to register at the visitor center, and remember that tickets are first-come, first-served. The ferry boat's capacity is 35 passengers. Always remember that one of the most rewarding experiences, a walk on the beach, is free. Public access points abound, so shed your shoes and enjoy a stroll in the surf. St. Augustine accommodations are grouped in three areas: the western fringe near I-95 that's adjacent to the outlet mall, the downtown historic district, and the beach. Chain hotels can be found in all three areas, but are most common along U.S. 1, State Road A-1-A and I-95. In the historic district, you'll choose from nice collection of bed & breakfast inns that offer proximity to most of the sights by foot. Keep in mind many of these establishments offer only a few rooms, and they can be booked weeks in advance. The same is true of favored vacation homes on the beach. Be sure you reserve early. Airbnb.com lists nearly 200 St. Augustine area homes, rooms or shared rooms for rent. For a relatively small city, St. Augustine offers many affordable restaurants. Some are within walking distance of the historic district. One budget favorite is the Spanish Bakery & Cafe at 42 St. George St. in the historic district. Patrons frequently eat under the shade of a large cedar tree on the property. Empenadas, homemade soups, and Cuban sandwiches are favorites, and a filling lunch usually totals less than $10. Cuban specialties are also available at Columbia and La Herencia Cafe, where prices are a bit higher but the value is superb. Just north of the historic district, Raintree is nice for a budget splurge. Patio dining and ample indoor seating augment excellent service. Menu entree prices range from $13-$30.